Refurnished 3-bedroom house that can accommodate 6 persons on the first floor. There is a big cozy yard enriched with a variety of flowers. The traditional barbecue and the old stone oven encourage outdoor feasts. The two of the three bedrooms have a double bed each and air condition. They have also a 28'' LED TV and a 14'' CRT TV. The third bedroom has a single bed and a semi-double bed. There is a kitchen, a bathroom and a hallway with a table. 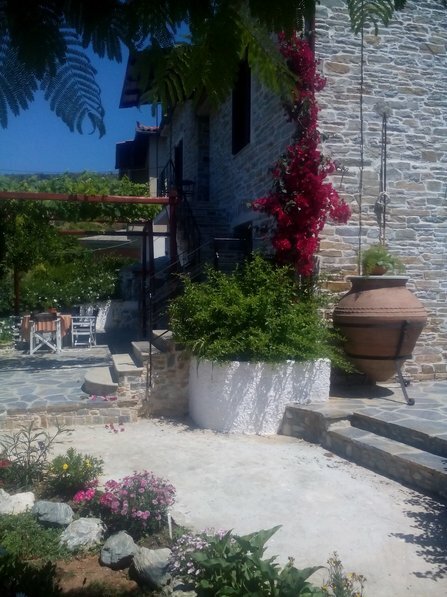 The house is located over the central square of the village (5 minutes walking) where there are taverns, cafeterias, a super market, a bakery and a car rental agency. The 3 beaches of the village are in walking distance that can reached in 20 minutes. The distance between the house and the central square is 160 steps. The distance between the house and the sea is 150 steps. The distance between the house and the closest beach which is called "Lagoudi", is 5-7 minutes walking. There is not enough space to park there. This beach is suitable for both children and adults. The distance between the house and the beach "Kallifteri", which is one of the best in Europe, is 8-10 minutes walking. Since there is a big parking area there, driving to the beach would not be a problem. In order to go to another cosmopolitan beach which is called "Abovos", it takes 10 minutes walking, crossing the whole village. Driving there is an option but in summer the road is congested.